My art career began in the Arkansas Ozarks in the early 1980s. I began painting and weaving as a member of the Arkansas Craft Guild. As a weaver and dyer of textiles, I was honored when, in 1993, I was selected to create an ornament for the White House Christmas tree, on view for visitors to the nation’s house through that season. In the early 1990s, I relocated to the peninsula in Monterey, California, where I began painting in silk exclusively. I was drawn to the luminescence of the transparent dyes on the shimmering silk and that I could work with the dyes like a watercolorist. I focus on silk scarves and pillows as a basic rectangular form for my subjects. My interests in nature, birding, weather, landscapes and more are reflected in my designs. Each scarf or pillow is unique, a one of a kind painting in a functional form that can be worn or displayed. 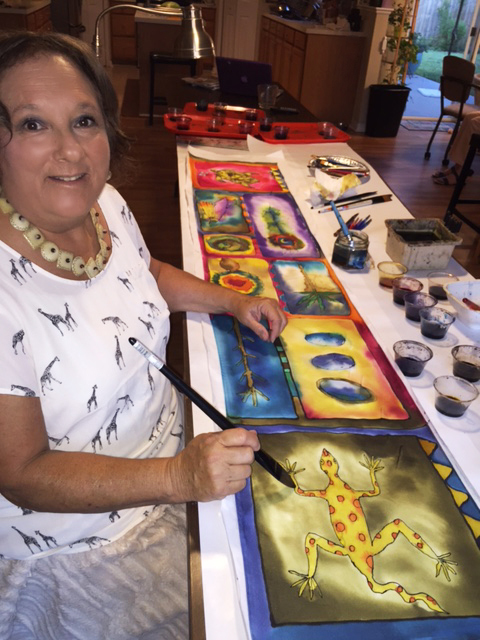 Now that I have moved to the St. Augustine, Florida area, I am excited to interpret the unique nature and landscapes of this area in my silk work.